The Aqua Lung Zephyr snorkel is a comfortable and reliable snorkel - and at under £20 it's an absolute bargain. The Aqua Lung Zephyr snorkel is a comfortable and reliable snorkel - and at under £20 in our end of summer sale it's an absolute bargain, perfect for use with the Aqua Lung Favola mask. 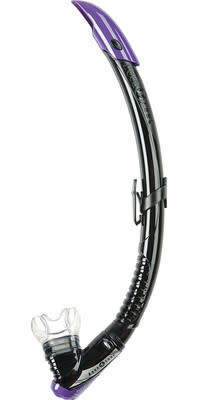 Features of this snorkel include a splash guard with purge channel on the top and an elliptical purge valve for clearing the reservoir at the bottom. The integrated corrugation zone offers great flexibility and the comfo-bite hypoallergenic mouthpiece with rotating assembly makes for a comfortable breath. An easy, quick-adjust clip for mask attachment is also included.